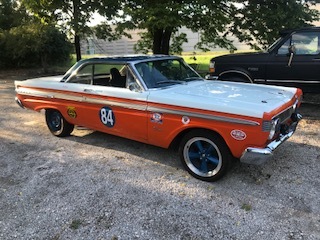 62 Comet 170, dagneham trans, 2.8 7.25 rear 260 T5 8 inch swap planned for the future. A 450-500cfm 4V carb will work well. I've also used the 390cfm Holley but prefer the slightly larger carbs - they run better. Holley has a few options...their 465cfm traditional carb (I believe they have versions with hot air or electric choke options) as well as the 80570 Street Avenger (the polished zinc version) which is marketed as a 570cfm carb but actually flows 465. I used the latter on my mildly modified (268H cam & Edelbrock intake) and it ran great. Summit has released a 500cfm version of their house-brand carb which is an evolution of the original Autolite 4100's (and Holley 4010/4011's) and appears to be a good value with annular boosters, etc. Or you can find a decent 1.08 Autolite and rebuild it! Any of the above should be GTG. 'cause Johno says you gotta have a sig pic! More fuel to make up for the inefficiency of the cylinder heads. 66 Cyclone GT; 245/60R15's on 15x8's and 215/70R15's on 15x7 Magnum's. There's nothing like the sound of a pushrod V8 singing at the top of her lung's. OL POP has a 77 bronco with a bone stock 302,with a CI INTAKE AND A 390 HOLLY, this thing runs like a singer sewing machine ans gets super doper M PG,,it has a AT trans and a 3.50 gear....works like a clock! I'll post my reply again. Click on the links and read what Shelby and the others designed for the 260 V-8. Many opinions here but I would stick with Shelby's design and research. Hi, Here's the set-up that will make you smile... Guaranteed! I visited my Father-in-law over Christmas and he showed me his new "toy". He had purchased a '65 Sunbeam Tiger. FYI a Sunbeam Tiger is a British sports car with a FORD 260 and then a 289 V-8 stuffed in it. The engine package was designed with help from Shelby. The car ran so much better than my Edelbrock 500 cfm Performer on top of a Performer 289 intake with a Performer cam. 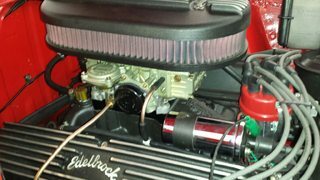 What I'm saying is forget the Edelbrock carb idea, Go with a Holley 0-1848-1 vaccum secondary 465cfm 4bbl carb with the Edelbrock Performer 289 intake and a Edelbrock Performer cam set-up. Why this set-up? I just finished putting this carb on my 260 with a Performer Intake and a Performer cam and the car runs $^*(%^^%(%$ Perfect. SO much better thatn the 500 cfm Edelbrock Performer carb with all their screwed up tune up spring and jet set. Out of the box this thing is perfect. Here's the carb info from Holley. I got one open box for $320.00 from Summit (sharksmotorsports) on ebay. If you still want to go with a Edelbrock, I'll sell you the one I just took off with the tune up kit. I would stay away from the finicky, rich running Edelbrock. I have a Holley Street Avenger 570 (465 cfm apparently) on my 302. Runs great. Quick question for you bmmaurer the cam is the Performer Plus 2122, or the Performer RPM 7122? Having a 260 I have this combo: Comp Cams hyd. cam (one step above stock with .447 gross lift and 212* duration int. & exh.) and a 4BBL. Then a C4 and a 3:25 open rear. The cam is so close to stock, that the idle is "just" slightly noticeable. When putting this engine together, I was thinking about an intake and found doing research that the aftermarket intakes show little if any difference from a stock Ford 4BBL intake. I then went with an 1.08 Autolite 4100 carburetor. 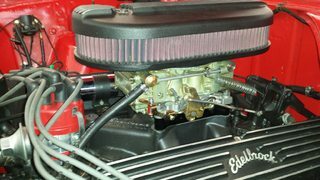 I had used this cam, intake, carb combo in my 63 Comet with 289/302 engine and 4 speed. It ran excellent and I changed to tripower and solid lifter cam just because. 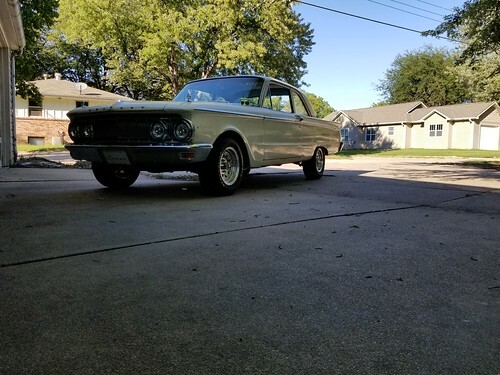 So I put the 260 in my 63 Rambler American (2520 lbs). I runs great and for fun took it to the strip and turned a 15.9. Not to shabby, considering stock muscle cars of the era turned low 15s. Had a pretty good stumble coming of the line. This is the only problem I had with this setup. Had the combo in the Comet with 4 speed, so no stumble. With the 260, an automatic is used. Found out the carb I am using is for a 390 and the accelerator pump portion puts out more gas. I have gotten around that and took it to the track again. This time that little engine came "on" and with an open rear, it just sat there and spun. So the Ford parts (less the cam) work very well. If you chose to use a 4100, make sure it is for a 289. Remember, the 260 is a "little" engine and the vacuum signal needed to open any 4BBL vacuum secondaries will NOT be in the lower RPM range. I tried different control springs with results that were not good!! Im using a 1.08” Autolite 4100 as well on my 289/4 speed car. It has a 3.40 rear gear and is fun to drive! I believe the 1.08” Autolite is 480cfm. 62Cometman wrote: Quick question for you bmmaurer the cam is the Performer Plus 2122, or the Performer RPM 7122?